With a new child on the way, space is becoming very tight in the Troll household, and difficult decisions have to be made. After a bit of soul-searching, I have decided to part with my Doctor Who audio collection. I have been building this collection for nearly twenty years, and it has provided some really enjoyable listening, most while painting miniatures. However, the plan is not just to dump them in the trash (or even dump them on ebay), but to carefully review them, keep a very select few favourites, and then pass the rest on. I believe I have about 70-80 Doctor Who CDs, so this process will take a while. The first step - I went through and eliminated the ones that I knew I never wanted to listen to again. This included a couple of well-remembered stinkers, several gimmicky ones (a musical, the one where you could listen to the two CDs in either order...), and a couple of ones that I have listen to very recently but didn't stand out as great. Most of these really are terrible, I can't recommend them, so they are going to get sold off. The next (and more fun) step is to start listening to them all again! This process started last night with The Island of Lost Souls by Mark Gatiss. This is an unique piece in my collection as it is the only Doctor Who audio in my collection that is not produced by Big Finish. In fact, technically it isn't Doctor Who - it's an Adventure in Time and Space starting The Professor and Ace, who seem pretty similar to the 7th Doctor and Ace, especially since they are portrayed by the same actors. Apparently there were seven or so of these produced before the BBC stepped in and forced changes. 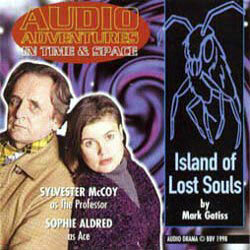 The Island of Lost Souls is one 60 minute CD, and all-and-all it is a fun little Doctor Who adventure. Set in Greenland during World War II, it's a pretty classic alien-threatens-isolated-group story with a little bit of WWII drama thrown in. The production quality is excellent. The acting quality is good, in fact, Sylvester McCoy is on top form here, much more like the Doctor he played than the caricature he often seems to play these days. The resolution of the plot is a bit cliche, but this is a minor criticism in the grand scheme. It's definitely worth a listen, It doesn't look like it is available as a CD any more, although you can apparently listen for free as part of your Audible subscription on Amazon (whatever that is). Otherwise, if you want mine, you can have it for £5 including UK shipping. Origins Award Nomination for Frostgrave! Exciting news! Frostgrave: Fantasy Wargames in the Frozen City has been nominated for an Origins Award for Best Miniatures Game! Growing up in the USA, the Origins awards were the biggest game awards out there, and I remember seeing many games that proudly displayed their Origins badge of honour. So, it is really neat to get my own little Origins badge – even if it only turns out to be for a nomination! The other nominations are: Guild Ball, Age of Sigmar, Star Wars: Armada, and Wrath of Kings. The winner will be announced at the Origins show in June! While I’m not complaining, it is rare these days that I get a lot of time to myself. Gone are the days where I can consistently devote two-hours straight to painting a figure. However, a couple of weeks ago, my wife and daughter were spending a night with the in-laws... With no one around but me and the cat, I broke out the painting supplies, got my walkman and a Doctor Who audio adventure, and decided to devote some serious effort to a single figure! Poor Theoden had been sitting on my painting table gathering dust for some time. I knew that I wanted to paint him ‘by the book’, and I also knew that it was going to take some serious time and concentration. In the end, it took even longer than the Doctor Who, but I got him finished! The real challenge of this figure was the armour, or specifically, the gold trim on the armour. It was extremely fiddly, and when painting gold on black, any little mistake practically glows at you. I probably spent more time repainting bits of the armour than I did painting the rest of the figure. In the end though, I’m extremely happy with the result. The figure is simply fantastic, one of the premier pieces in a range full of great sculpts, and I really wanted to do it justice to the best of my abilities. I can’t wait to get him on the table leading some Rohirrim! As a student of the American Civil War, I have encountered Charles Pomeroy Stone on a couple of occasions, always in relation to the Union disaster at the Battle of Ball’s Bluff or the subsequent investigation (inquisition?) by The Joint Committee on the Conduct of the War. Basically, he has always seemed a footnote, more a victim of circumstance than a maker of history. So, when I came across the new book The Extraordinary Life of Charles Pomeroy Stone by Blaine Lamb, I was intrigued. Not really knowing what to expect, I gave it a go, and I’m really glad I did. Charles Pomeroy Stone did indeed live an extraordinary life! A West Point graduate, he served in the Mexican-American War as an ordinance and artillery officer. He even led an expedition up a volcano during the long occupation of Mexico city (An expedition that the young Ulysses S. Grant would give up on). After the war, he returned to Mexico as the leader of a dangerous and controversial expedition to survey uncharted territory in Sonora. When that collapsed due to internal Mexican politics and external American meddling, Stone travelled to Washington D.C. on the eve of the Civil War. Meeting with his old army commander, Winfield S. Scott, Stone was placed in charge of the military security of the capital in the tumultuous period after Lincoln’s election, through his inauguration, and into the early days of the Civil War. This is a part of the Civil War that is rarely discussed, but it is chilling to think how easy it would have been for a lone assassin to kill Lincoln before he even became president and send history down a different path. Unfortunately for Stone, that early success is nearly forgotten now. For only a short time later, he was the commanding officer at the disastrous Battle of Ball’s Bluff, that witnessed the death of a close friend of Lincoln, the capture of some 700 Union Soldiers, and the deaths of many hundreds more (some of the bodies of those who died would drift down the Potomac to the capital city). Although it is debatable how much Stone is actually to blame for the defeat, he was vilified by the press and eventually called to testify before the newly formed Joint Committee for the Conduct of the War. There, abandoned by his commanding officer, George B. McClellan (just another reason to dislike that guy), and ridiculously accused of being a Southern sympathizer, he was thrown in prison without a proper trial or even formal charges. Eventually Stone would be freed, and even return to the war in time to join yet another Union disaster, this time the Red River Campaign. After the war, the disgraced Stone accepted a job offer to reform the army of Egypt. Serving for 13 years as the Chief of Staff of the Egyptian Army, Stone oversaw many reforms, but eventually watched it all come undone in a series of bad offensives, political infighting, and the eventual invasion by the British. From there Stone returned home, and thanks to some old army connections (namely Grant and Sherman) was given the job of overseeing the construction of the foundation and pedestal for the Statue of Liberty. Like everything in Stone’s life, this too was an up-and-down affair mired in controversy. It is hard to believe all of that is revealed in just 225 pages of text (and 40 pages of notes and bibliography)! Despite the short length, Blaine Lamb does a great job of telling the story, almost always giving just as much detail as the reader could want, without getting bogged down in minutiae. (I wish he had dropped in more reminders of Stone’s age at various points, but this is a minor quibble.) His prose is clean, clear and easy to read, and I often found myself reading for longer than I meant to in a given sitting. So, all and all, a fantastic work of history. Charles Pomeroy Stone may not be one of the great players of the 19th century, but his life is extraordinary and deserves to be remembered. Blaine Lamb has done an admirable job of bringing his story out of obscurity. Recommended! 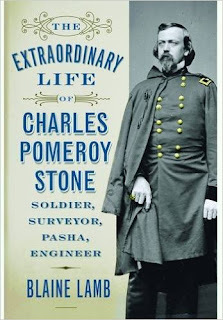 TheExtraordinary Life of Charles Pomeroy Stone: Soldier, Surveyor, Pasha, Engineerby Blaine Lamb was published in 2016 by Westholme and retails for $29.95. 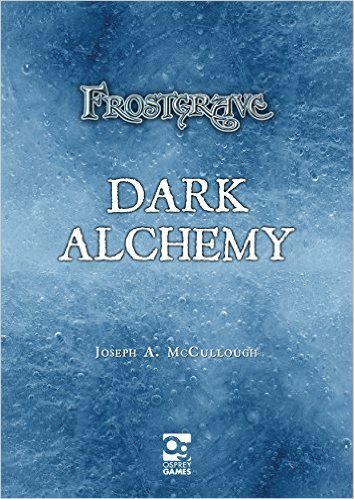 Frostgrave: Dark Alchemy is now available! 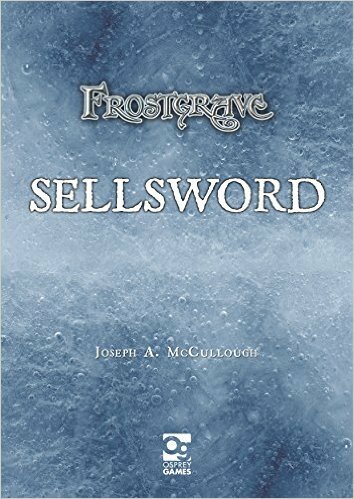 An exciting day, the newest ebook mini-supplement for Frostgrave is now available! This supplement is a bit more experimental for me as it includes a three-scenario campaign designed to be played either solo or by two players playing co-operatively. It also contains new rules for potions. Not bad for £3! First up, thanks to everyone who has responded so far to the Experience Points blog! The response has been overwhelming and real food for thought. There is actually a lot more variety of experience systems being used than I realized! More on that later. This is the basic rulebook. It contains all of the rules you need to get started. This short, ebook, mini-supplements contains the rules for Captains, a new type of soldier than can gain experience and learn tricks of the trade. Captains are probably the biggest rules addition to the game so far. The first, full-length print expansion for Frostgrave. This book contains 10 linked scenarios that chart the rise of the evil Lich Lord. It also includes a few new spells, some new soldier types and lots of new treasure and creatures. This ebook, mini-supplement contains a three-scenario campaign and some new magical treasure relating to constructs. A fiction collection with 11 short stories by 11 different authors set in the Frozen City. Out in just a couple of days, this new ebook, mini-supplement has a three-scenario campaign designed to be played either solo or co-operatively with two players. It also contains an expanded potions table. The next print supplement, due out in July. It includes rules for playing games underground including traps and secret passages. It also introduces some new magic, the lost spells of the Beastcrafters! Look out for the special 'Nickstarter Pre-Order Campaign' launching in June! Frostgrave has been out for about nine months now, and in that time it has received more ‘play testing’ than I could have ever dreamed. Thousands of games have been played, and I’ve done my best to read, watch, and analyse as many as possible. From that, I am confident in saying that there is nothing in the game that is ‘broken’, that is, there is nothing that makes the game unplayable. However, I do believe there is plenty of room for improvement. Probably the most controversial aspect of the game system is experience points. There was a lot of shouting about them right after release, and I suspect it is the most commonly house-ruled element of the game. That’s wonderful. I love house rules, and it is great that people like the rest of the system enough to spend the time modifying the game to suit their needs. That said, as a rules-writer, it would be better if I could come up with an official system that kept game balance while making the vast majority of players happy. I am now beginning that process, and I’m asking for feedback! So please comment below. 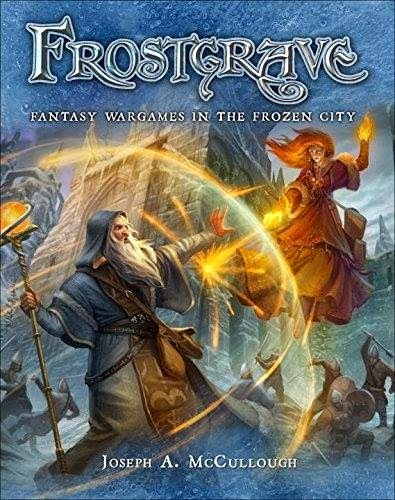 Currently there are four main ways for wizards to earn experience points in Frostgrave, and these are my thoughts on them. This is the main point of controversy. Since wizards only receive xps for stuff they kill directly, it stands to reason that wizards who are better at killing things will receive more xps. There is some internal balance to this, but perhaps not enough. If I were writing the game now, I would definitely lower the killing stuff xp rewards. In fact, I would probably take it all the way down to a flat 25xp for killing a wizard, apprentice, or soldier. I know there are some people who have done away with kill rewards altogether. In most of the scenarios in The Thaw of the Lich Lord campaign, wizards are given xps for all servants of the Lich Lord killed by anyone in their warband. Although this doesn’t make strict sense, I wonder if players would prefer this system where the reward is just for the kills and regardless of who exactly does the killing? When working on the game, I don’t think I fully grasped how the recovery of treasure in a game was a double reward. First you get the xps and then you also get the treasure. I don’t think this is a major issue, and since grabbing treasure is still the point of the standard game, I wouldn’t want to change anything too drastically. I would probably take treasure recovery down to 35xp. This would mean in a tie game, where each player gets 3 treasures, they would each gain a level. Or, if a player sweeps the board, they still only gain two levels instead of three from treasure. If other xp rewards are going to go down, this is the most logical one to put up. When I first wrote the game, the plan was to give 25xp for each different spell successfully cast by a wizard or apprentice during a game. I can’t remember why I changed it, and I have always been slightly disappointed that I did. This system would give more reward to wizards who used a variety of spells during a game, which is more in keeping with the theme. It also means that wizards that had a bad spell casting game and only got off one or two spells would still get a descent xp return. While not used in a ‘standard game’, I think most people generally play scenarios. I think most people will agree that xp rewards for specific scenario events (such as drinking from the Well of Dreams and Sorrows) add a lot to the game. However, the more scenario rewards that are available, the less xps should be gained from the above three sources. In a future supplement, I am planning on introducing a table of ‘subplots’ that players can roll on before the game to generate scenario rewards, thus turning even standard games into more specific scenarios. So, it might be a good thing if xps from killing, treasure, and spell casting actually go down. There are a few other ways to gain xps. The most obvious is the Absorb Knowledge spell. This spell exists partly to offset the advantage of killy wizards. In retrospect, I think I should have made its casting cost a bit higher, probably a 10, but I don’t think it is a major issue. I suspect, even with all of the possible modifications above, it would still not be a major issue. Yhere are a few other ways to gain bonus xps. I think these can be fun, but I don’t want too many of them out there as combined they could get out of hand. So, those are my thoughts on experience points at the moment. Now, I really want to hear what you, the players think. I don’t know when, if ever, I will make an official change to the rules, but if I do, I want to make sure they are ones that both I, and the vast majority of players, are happy with.